LAGUNA HILLS, CALIFORNIA, June 17, 2011 – With tablet computers continually making headlines, and company giants developing their tablets to be thinner and lighter than the competition, there’s one fact that remains the same. A great case is needed to protect the tablet as well as provide amazing versatility. The ZooGue Samsung Galaxy Tab 10.1 Case Genius offers that and much more! Functionality is a much needed attribute when searching for the perfect case. Adding the benefit of adjustability and convenience, the ZooGue Case Genius makes the decision of buying a case an easy one. With the ingenious design, the case provides a fully-adjustable stand that is secure and stable. 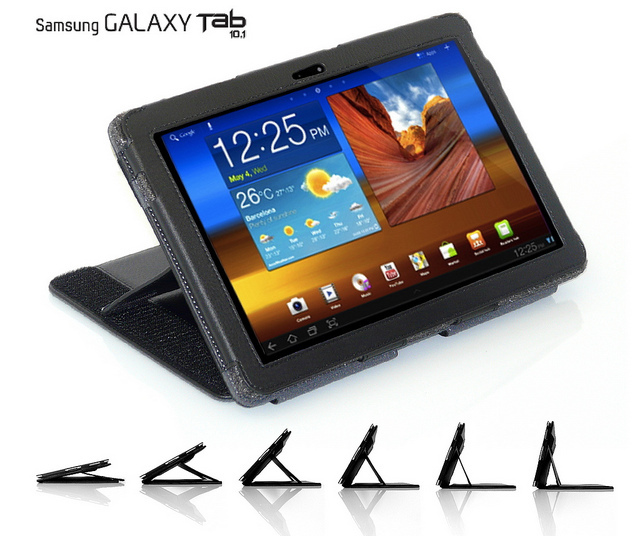 This allows the customer the ability to view their Galaxy Tab 10.1 at absolutely any angle desired. Giving presentations, working in class, watching movies or just reading a book, the ZooGue Galaxy Tab 10.1 Case Genius will provide the exact angle needed for optimum viewing. Even though the fully adjustable stand sets the ZooGue Case Genius apart from its competitors, the added convenience of a strap gives even more functionality. Providing a secure hand strap, case closure or an adjustable headrest mount for the car, the options remain unparallel to other cases. Offering access to all cameras and ports, once placed within the ZooGue Case Genius the Samsung Galaxy Tab 10.1 never needs to be removed for charging, internet chatting or taking pictures. Every detail was considered when designing this remarkable case. As tablets continue to evolve and become lighter, thinner and sleeker, having a high quality secure case becomes even more important. ZooGue understands the importance of protecting your precious tablet, so they offer the most functional and adjustable tablet computer cases on the market. Providing a protective shell is just a bonus. With the overwhelming response from their customers over their multi-functional case design, ZooGue decided the next great tablet required the best case available. The New ZooGue Samsung Galaxy Tab 10.1 Case Genius is available for pre-order at www.ZooGue.com and is expected to ship the end of June. ZooGue is inspired to continue to bring innovative products to their large base of customers who require nothing less than perfection. They are committed to making the best products and will continue to strive for excellence.